Don't let the title confuse you, this is not a chicken recipe. 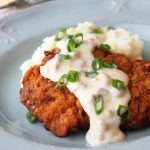 This chicken fried steak recipe is actually a tenderized beef round-steak that's been run through the tenderizer twice. Then seasoned, battered and fried in deep fat and topped with a delicious seasoned gravy. Bon Appetit!Note: You can change the number of people served by placing your cursor over "Servings". The Ingredients will adjust to the new number of servings. In a shallow pan, mix the flour, salt, pepper and Cayenne together. In another shallow pan, whisk the egg and milk together until well mixed. In a large, 12-13 inch skillet, heat the 1 1/2 cups oil until very hot. While the oil is heating, dredge the steaks one at a time in the seasoned flour, then let them soak a minute or two in the egg mixture. Then dredge them in the flour again, coating them thoroughly. Place the steaks in the hot oil and fry till browned, about 2-3 minutes on each side. Remove steaks and set them aside. Pour off all but about 1 tablespoon of oil from the skillet, leaving the residue of the meat and any brown crust remaining on the bottom. Heat until hot then add in the onions and cook until light golden brown, about 3 minutes. Stir in the 3 tablespoons flour and mix well with the onions until blended then stir in the chicken stock, whisking constantly. Continue whisking until the gravy comes to a boil. Add the cream and parsley and cook for 1 minute, whisking constantly. Adjust seasoning with salt and pepper if necessary. Serve immediately with mashed potatoes, topping with gravy and green onions.